Expertly designed by Dorit Jordan Dotan, the print version will be ready late September. The exhibit, an expanded version of the previous JOMIX, is curated by Joel Silverstein, Aimee Rubensteen, and Richard McBee. Wendi Furman and Yona Verwer assisted as curatorial advisors. On view at the Philadelphia Museum of Jewish Art September 1 till November 15. 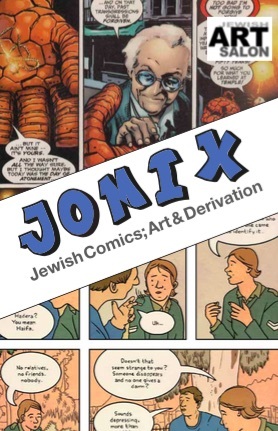 From the invention of Superman by Jerry Siegel and Joe Schuster, to the graphic novel Maus by Art Spiegelman, Jewish artists and writers have served an essential and indispensable role in the comics and graphic novel industry. This exhibition explores a roster of cutting-edge creators, reinvestigating traditional genres like superhero, political satire, romance, horror, science fiction and confessionals through a Jewish lens.